: Gallery... Now that the prototype atmospheric modification device has been completed, we must eliminate those who pose a credible threat to our plan. : The humans and the Ancestors, yes? : The whereabouts of the Ancestors that Dante encountered recently are still unknown. : Mh... Leave no stone unturned. The Ancestors must be found. : Emperor Gore, General Dark is here to see you. : Fine... Let him pass. : So word has reached you already. : How about it, Emperor? I'll go out and do battle with them. : But you've just awoken from a long slumber. You're not yet in top form. : I owe the Dinosaur Empire a debt. Plus, to support the atmospheric modification plan... Rather than giving me warmup exercises, let me take on Getter and Mazinger and their group. : It's nothing. I need to pay them back as well. : Emperor, I, Gallery, have arranged a secret plan to eliminate Getter. 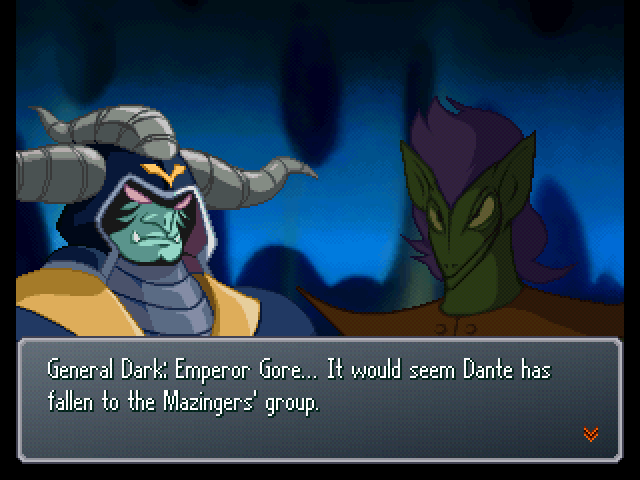 : Oh hoh... Then work with Duke Gorgon and Dante, and bring me their heads. : This should be interesting. I'll be glad to witness the handiwork of the greatest scientific mind in the Dinosaur Empire. : Your bad attitudes could have gotten Benkei killed... You got lucky this time, but next time this happens, someone could die. : Well, leave it at that, Lieutenant Burning. : Infighting among teammates can affect everyone's morale. : You've lectured them enough... And they must have reflected plenty on it, too. : Besides, right now we're on high alert. Let the matter drop for now, please. : Roger that. Okay, all of you stand by in your own quarters. : No, this is a good chance to spell things out. 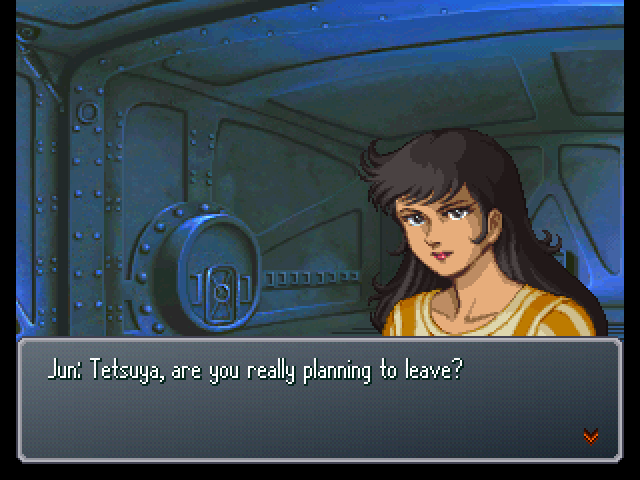 Tetsuya... if you don't feel like matching pace with the rest of us, then get off this ship. : It's not a laughing matter when someone gets hurt because of your selfish actions. : ...Do you have any room to talk, Shinobu? : Shinobu... I don't need you to tell me that. 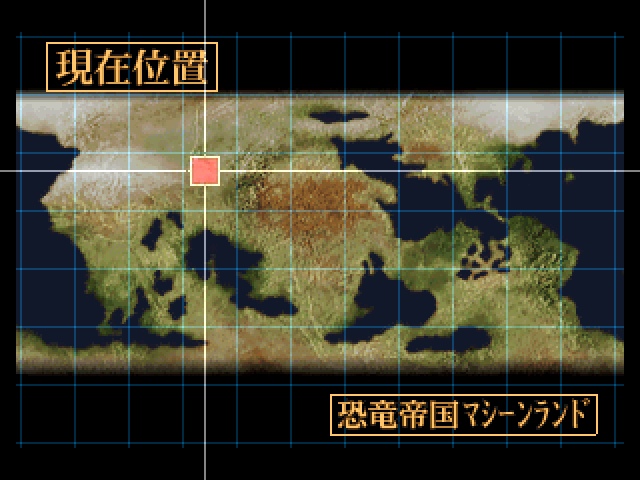 I'd originally planned to leave the ship after reaching Gallia anyway. : This is as good a time as any. I'm leaving. : Do what you want. I don't know what's bugging you, but the way you are right now, I can't trust you to watch my back. 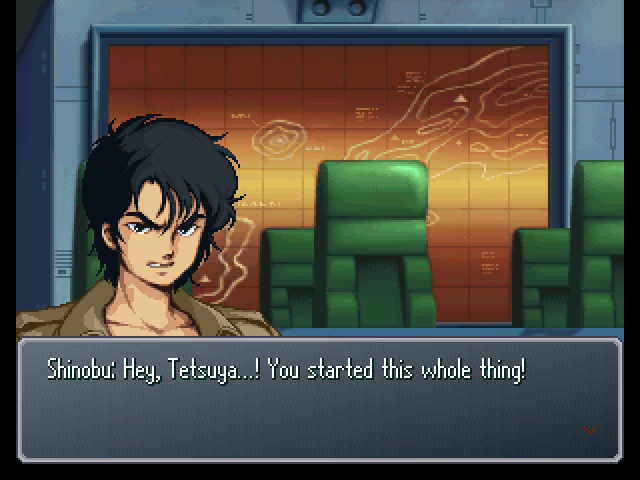 : Tetsuya, calm down. This is no time for us to be fighting among ourselves. : You're exactly right. That's why I'm going to act alone. : Sure. Works out better for all of us that way. : He's seriously going to leave, isn't he? : Hayato... Why didn't you try to stop him? : Like I said before, it works out better for both sides this way. : Again with your precious teamwork? You don't have any room to talk about that now, though. 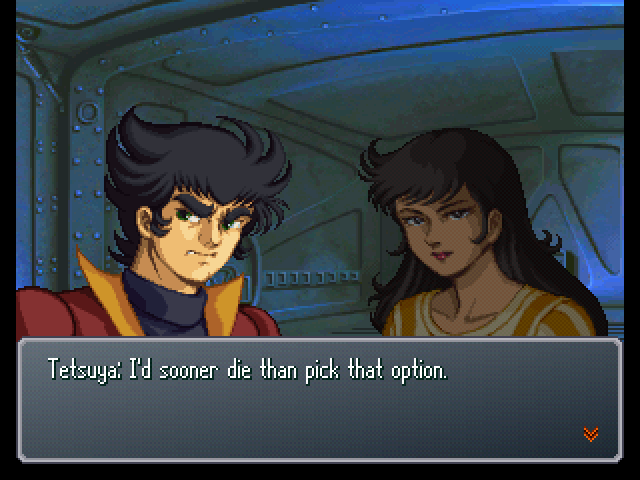 : So you're not going to listen to what I say, Hayato? 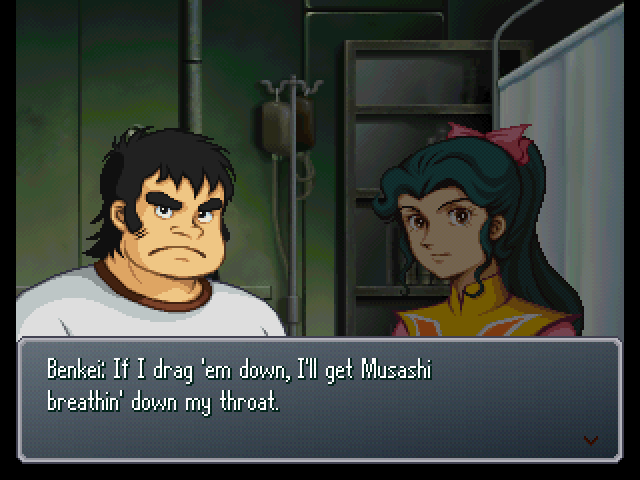 But, if we'd changed into Dragon back there, Benkei could have made it out unscathed. : Can you say that for certain? In that situation, destroying all units was the best guarantee. : I'm the leader of the Getter Team. I call the shots! 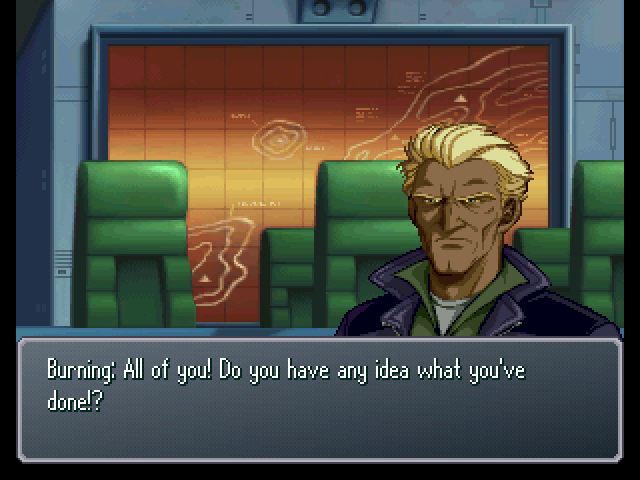 : Looks like you're letting this leader thing go to your head, Ryou. It's getting on my nerves. : Hold on! Don't you two start fighting, too! : Yeah! Lieutenant Burning just finished lecturing you! 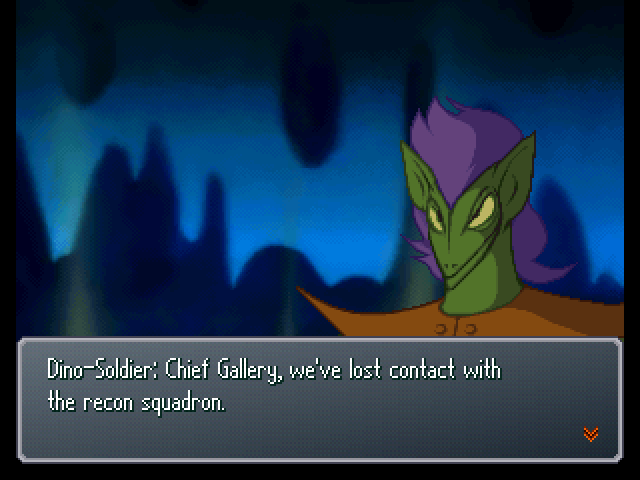 : ...Cyber Beast Force, you guys stay out of this. 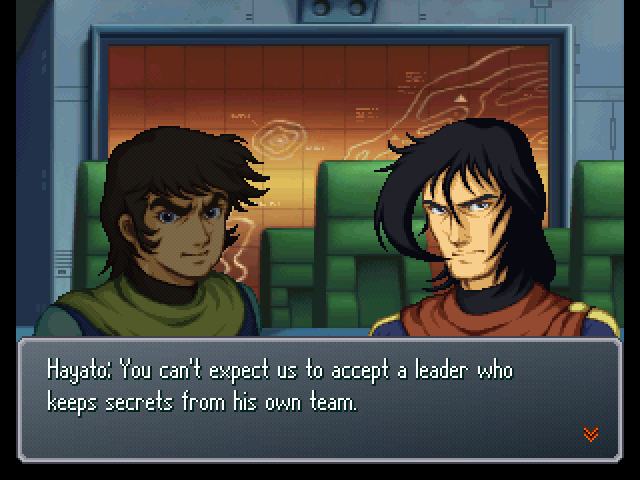 : Hayato, the way things are, we can't work together as a team. 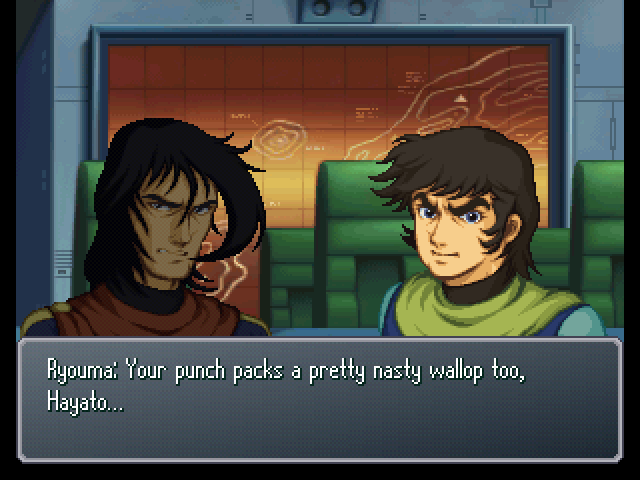 : Heh... Then we should break the Getter Team up, huh. 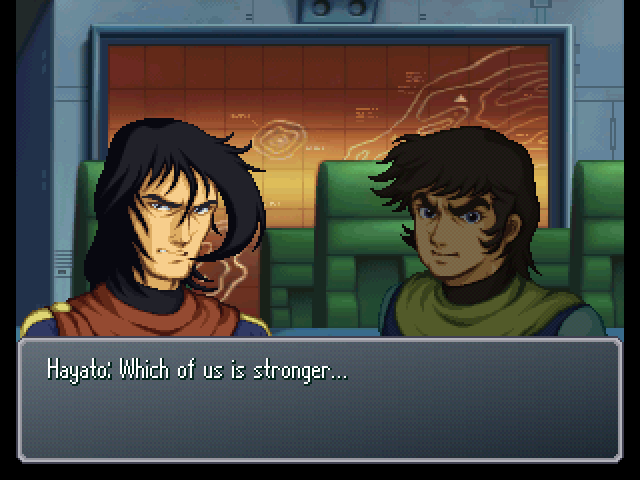 : Don't you understand what I'm saying, Hayato!? : Now you've done it! : Shinobu, Ryo! Quit watching and stop them! : Leave 'em alone. Internal disputes should be settled among the team. : Masato, Sara, we're leaving. The Cyber Beast Force leaves the room as the two Getter pilots continue to duke it out. : But it's not over yet! : I've got no reason to stick around, Jun. : ...If you've got nothing to say, then get out. 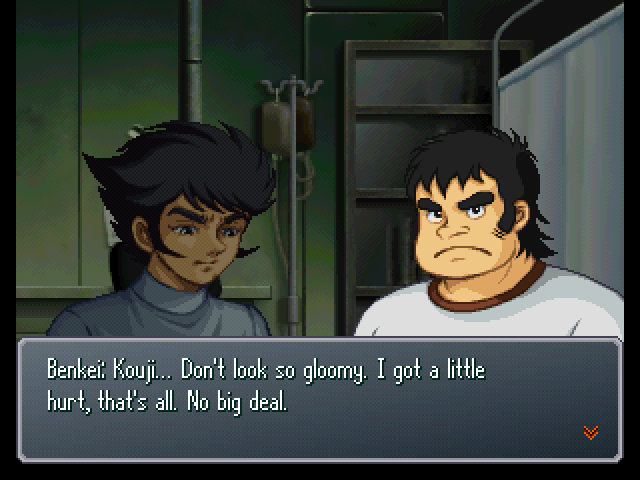 : Yes, the Chief is Kouji's real father. But didn't he raise us with love, as his own children...? 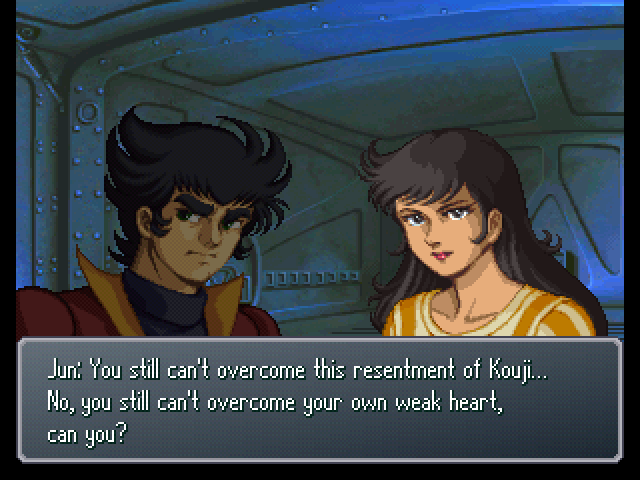 And yet you're letting some petty jealousy cause problems for Kouji and everyone else... I've misjudged you! : I know that! But that jealousy and resentment keeps simmering in my heart, like muck... At the rate things are going, I'd just make the others' lives miserable if I stayed around. : Tetsuya... Are you afraid? : Afraid...? What do you mean by that...? : You're not afraid of causing trouble for the others at all... You're afraid of being crushed under the weight of your own weak heart...! : So stay in the ship and let the others guard it...? : ...I have my pride as a soldier. Listen, I won't hear any more from you about the way I fight. Stay out of this. : When we heard you got shot down, it gave us a scare. : But I'm glad you're okay. : Heheheh... Being tough's my whole schtick, y'know. 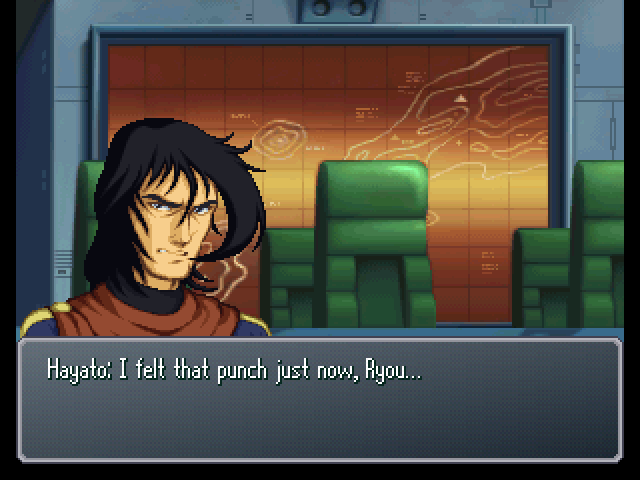 : Hey, I heard Ryou and Hayato got into a fight after that. : They did. 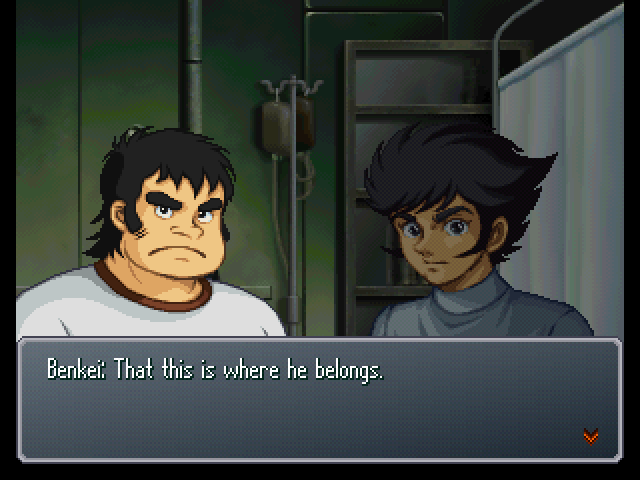 Finally, Daisaku and Daijirou intervened and stopped them. I swear, there's a time for fighting and this isn't it. : But it's rare to see the Getter Team get into a fight. 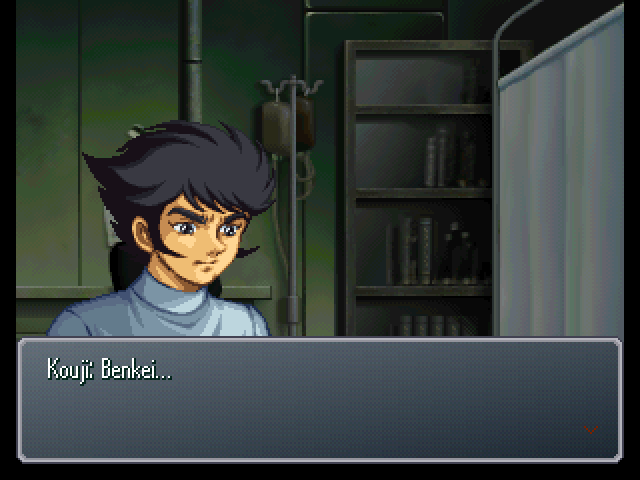 : Hey, Benkei... Do you think Tetsuya's really not coming back? : ...He probably hasn't figured it out. : Don't worry too much. He'll be back, I'm sure of it. : Now, then... Can't stay like this forever. Better get ready to be on launch standby. : Don't be ridiculous. You need more rest! 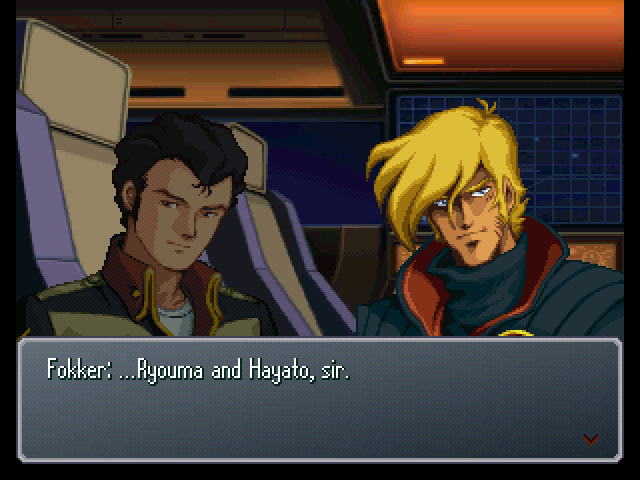 : No, Ryou 'n Hayato 'n I bein' together is what makes the Getter Team. 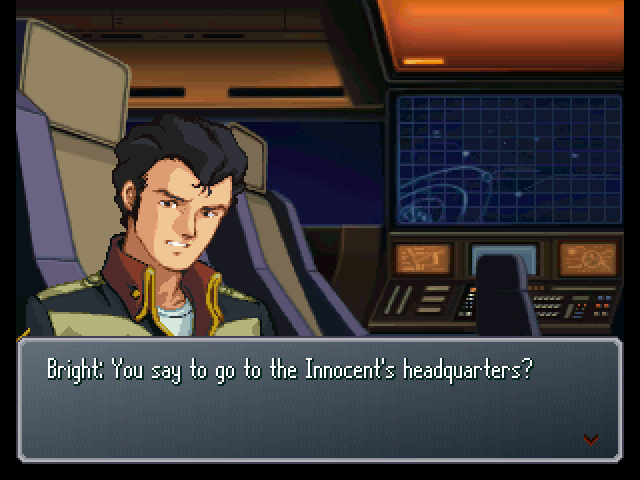 : Yes... We must meet with the Innocent's leader, Arthur Rank. : But regardless of their leader's personality, the Innocent have been attacking us. : It could be that he's not the one who holds the real influence with the Innocent. : Happens all the time. : And even if we met with Arthur Rank, there's no guarantee negotiations would work out. : But there should be those among the Innocent who are opposed to fighting. I consider it a more prudent approach than treating all of the Innocent as our enemies. 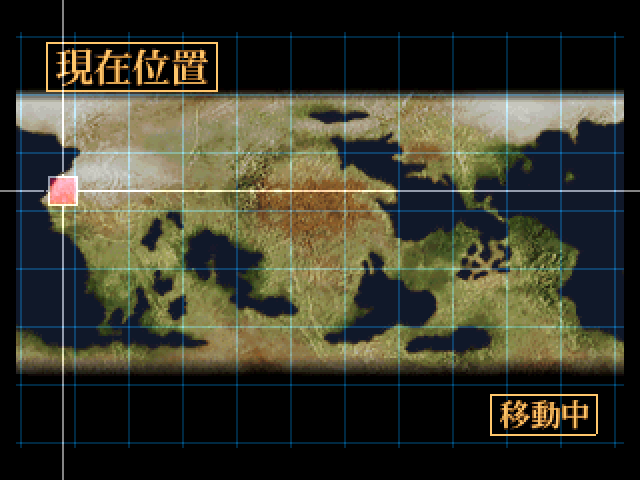 : And we could also learn Elche and Tifa's whereabouts from the Innocent. : (.........) I suppose so. We'll put it on the table for discussion. 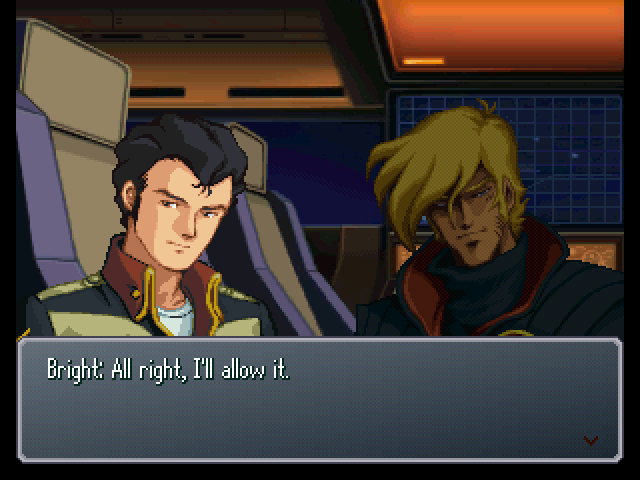 Saegusa, stop the ship. : Is this about Tetsuya? : Yes. I was considering sending out a search party that doubles as a recon squad. : Who would you put in the search party? : There've been a lot of bad vibes going around the ship lately. It's starting to bother me. : But that could just as easily blow up in our faces. : Drastic measures are in order, hm?